While I was mulling over the roasted pumpkin, pancetta and sage soup recipe I kept thinking about how well sweet roasted pumpkin goes with creamy and tangy blue cheese. The soup was already packed with flavour and certainly did not need any more but I still wanted to include some blue cheese in the meal. I often enjoy serving garlic bread with soups and you really cannot go wrong topping garlic bread with cheese so I was thinking that a blue cheese garlic bread would go perfectly with the pumpkin soup! For this garlic bread I went with a gorgonzola dolce which is a milder, young blue cheese that is soft and creamy. After leaving it out on the counter to come up to room temperature it was really easy to cream it into the garlic butter to spread all over some unsuspecting bread before popping it into the over to broil until nice and golden brown and bubbling and good! I have to say that this blue cheese garlic bread is pretty amazing stuff and it went so well with the roasted pumpkin, pancetta and sage soup ! I can easily see serving this version of garlic bread with a lot of different dishes. I love cheesy garlic bread with soups too, especially creamy tomatoe soup. Looks delicious. Gorgonzola and garlic bread are two of my favourite things – I can't believe I never thought to combine them! That looks so good! I love garlic bread. This version with gorgonzola is just awesome. I was wondering what that piece of cheesy bread deliciousness was behind the soup! Amazing! 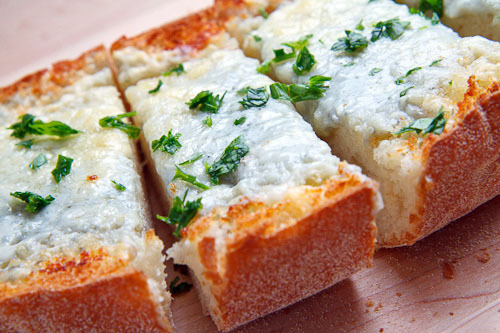 What a great twist to traditional garlic bread! Yum. The only problem with cheesy garlic breads is that I want to eat the whole loaf and then I'm too full to eat anything else. Oh my! This looks so good. I have a weak spot for Gorgonzola and I can't think of a better way to eat it than melted on some crusty bread. Yum! Chis: I have that problem as well! I adore gorganzola and garlic bread so a combination is just heavenly!! A tasty sounding recipe that'll probably never see the light of day when my husband's not out of town (not a fan of either garlic or blue cheeses)–so I'll indulge when he's away, I guess! this looks so delicious!!!! I can't wait to try to make these! This looks so good! I love cheesy garlic bread! Why do people comment on here when they have never actually made the recipe??? I will never understand that. People are looking for reviews of whether it is worth making a recipe, not “gee that looks good”. Really?! Tell me how is tasted!